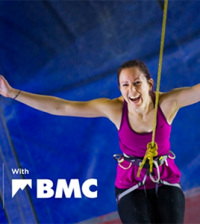 If you’re feeling inspired to try something new this year how about climbing? Emma Twyford has been at the forefront of British women’s climbing for some time and here she tells us how she got into it, exactly what the benefits are and the best ways in which to get started. I’ve been climbing for 20 years, since I was just seven years old. I was really lucky because my dad was part of a mountain rescue team and was in to the sport, so he used to take me along with him. I started climbing outdoors, on rocks and boulders, but nowadays it’s more likely that you would start climbing at an indoor centre. I was just really lucky to live in that environment. I loved it and used to go out every Wednesday evening in the summer. The climbing group gave me a really good start and passed on so much of their knowledge. There were many different characters, some were mountain expedition types and others were more general outdoor people, it was a real mix. Now I have to juggle holding down a job and climbing as much as I can; I guess you could call me a semi-pro climber. Climbing has a much higher profile than it did when I started, plus there is a whole industry around climbing – books, videos, magazines, and of course YouTube has meant that anyone can post their latest climb for everyone to see. My advice to anyone wanting to get started in climbing is to start with a course at a climbing wall and then if you like it you can join the club. It’s also really popular at universities, and a great way to get started as it’s a really social scene too. 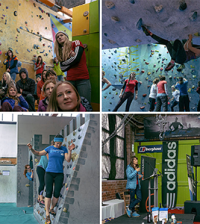 As a sport, climbing attracts many different types of people. You don’t have to have a particular body shape to enjoy it because there are so many different styles and ways of climbing. Mostly when people start out they rely on strength, but it’s just as much about good technique. It’s a benefit if you are flexible, and dancers and gymnasts can make really good climbers, and when done well, climbing can look amazing – like ballet on rock. Because I was so young when I started and not particularly strong, I learnt to use my legs more, which makes for a more balanced climber. Generally though, as a fitness activity, it is a brilliant all-body work-out. If you get into the sport you will find that you develop your own technique and learn more about movement and how you can improve by making small changes. There’s also a lot of coaching available if you want to take it to the next level. There is a lot to take from others too – you can watch and learn. It’s a competitive but supportive environment. If you would prefer to climb outdoors then start with bouldering, you don’t need much equipment and you can build up your confidence step by step. If you do want to try roped climbing then maybe try a weekend course to get a taste for it. It’s more serious because of the safety aspect, but that also means there is more teamwork involved, so it can be a really good bonding environment. If you do get into the sport there are lots of competitions that people of all abilities can enter. You just need to be aware of the risks and you need to be able to look after yourself. If you’ve done a course and started at a club then you will know all this, and you can just sign-up and get started. • Listen to your body. You will be stretching and pushing yourself to the limit at times so if you feel a niggle then rest or try a less challenging climb until your muscles have recovered. • You will be burning a lot of calories so make sure you eat a balanced diet and sleep enough – it’s important to stay healthy. • If you are doing a full day of climbing then take lots of snacks. You aren’t likely to want to eat a proper meal until you’re finished. I take a bar of fruit and nut chocolate, jelly babies and bananas! • Make sure you stay warm, it will help with your flexibility and help reduce injuries. I can’t live without my Mountain Hardwear down jacket; it’s warm, light and so comfortable. Roped Climbing: Whether indoors or out, if you want to climb a wall or cliff to the top then you will be roped up with another climber. When starting out this will mean that one person stays on the ground and supports the rope that is attached to you. If you do fall they use their weight to counter-balance you and break the fall –this is called belaying. It’s not as daunting as it sounds and you will be taught the technique by qualified instructors. 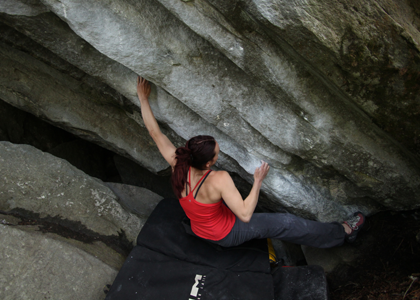 Bouldering: Bouldering is a form of climbing that, as its name suggests, takes place on boulders rather than cliffs. This means you generally climb rope-free as you are never that far from the ground. Soft mats placed under your climb area cushion your fall when you drop off. This style of climbing will involve just a few moves as the rocks are never that big, but you have the freedom to keep trying a climb over and over again. TheBMC.co.uk – The British Mountaineering Council (BMC) has a great website full of interesting articles and tools to help get you started in climbing. Click here for their indoor climbing wall search facility. UKclimbing.com – A really useful interactive location search tool for climbing walls, clubs, instructors and more. 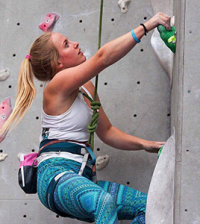 Womenclimb.co.uk *SPORTSISTER FAVOURITE* Women Climb is run by ordinary women who wanted information about women’s climbing, mountaineering and bouldering and couldn’t find it. Their blog reviews gear and provides information about climbing specifically for women. 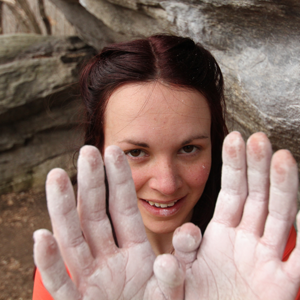 Womenrock.co.uk – Women Rock organise climbing courses exclusively for women using experienced women instructors. Based in the Lake District, the courses are adapted to suit any level with small ratios of clients to instructors. 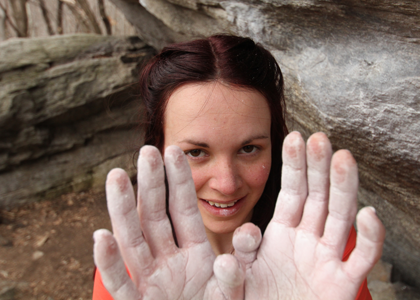 Climbing: Are you the face of This Girl Can Climb?